There is a fabulous range of Sakura Pens that can cover a wide range of colouring techniques. 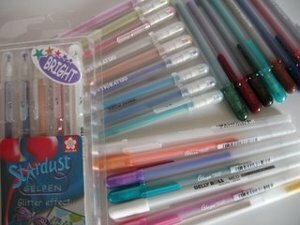 There are several pens in the "Gelly Roll" range and each can give you a totally different effect. There are Metallic, Souffle, Shadow, Glaze and Moonlight. And new ones are being brought onto the market all the time. There are dark and light tones and the only drawback is that they are quite expensive. They can be bought individually, but the most economical way is to buy them in sets, which makes them a little bit cheaper. Their versatility comes from the fact that they can be used on porous surfaces like card, paper, and chipboard, but they can also be used on non-porous surfaces like acetate and glass. They will work just as well on black, white and colored cardstock, for a complete range of effects. They are not however the same type of pen as the Alcohol Marker Pens and won't give you the same blended look. Some can be used as watercolors, when you are coloring in to create a softer look. Some can add a subtle sparkle to your projects. Try using them on metal, foam, wood as well as your card and paper. The Glaze pens can be used on metal and acetate. And on glass they give a stained glass look. Very pretty if you want to make your own decorative objects, but don't put them in the dishwasher !! The opaque pens are ideal to use on dark card, you need to play with them to appreciate the effects the different pens can create. Use them to highlight your stamped images, like adding sparkle to fairy wings for example, or to add faux stitching around your toppers. And if your writing is neat then you can add your own sentiments, greetings or verses in the color that matches your chosen scheme.